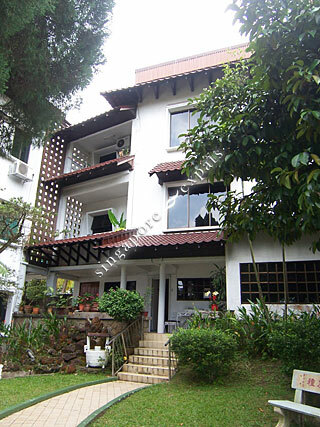 ZION MANSION is located at 23 HOLLAND RISE in district 10 (Bukit Timah, Grange, Holland) of Singapore. ZION MANSION is a Condo development. Educational institutions like THE EXPERIENTIAL LEARNING CENTRE, DOVER COURT PREPARATORY SCHOOL, TANGLIN TRUST SCHOOL, HENRY PARK PRIMARY SCHOOL, FAIRFIELD METHODIST SCHOOL (PRIMARY) and NEW TOWN PRIMARY SCHOOL are near to ZION MANSION. ZION MANSION is accessible via nearby HOLLAND VILLAGE, BUONA VISTA and DOVER MRT Stations. Zion Mansion is located slightly off Holland Road, at the end of a short, no-through road surrounded by other large mansion neighbours. It takes only 10 minutes’ walk to Holland Village to enjoy all its amenities there, including the Circle-Line MRT. It is a very quiet and private residence, with beautiful garden and classic building littered with Chinese calligraphy. You can hardly see any people within the compound. For those who like the hustle-bustle of Orchard Road shopping belt, it only takes 10 minutes’ drive or by bus to reach there. Within 10 minutes’ of public transport, one can reach the Buona Vista and One-North office buildings, National University of Singapore, Insead, Singapore Polytechnic, SIM University, Ngee Ann Polytechnic, Clementi Central etc. It is a superb experience living in an environment cut-off from the ever-congested and busy Singapore. This classic mansion has beautiful garden which is littered with Chinese calligraphy. From there, one can access Buona Vista office buildings with just one train station away. For those who like the hustle and bustle of Orchard Shopping belt, it is within reach just within 10 minutes driving or by bus. For Students and teaching staff of NUS, Singapore Poly, Ngee Ann Poly, SIM University, Insead etc, all can also be reached within 10 minutes of transport. Living here, you are free from the congested feeling of this busy small city.